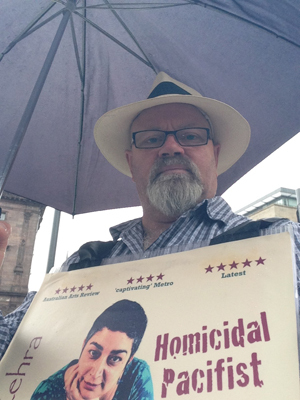 I was not planning to gig much myself this year in Edinburgh, as I wanted to be free to support and promote Sameena, who was performing her new show, Homicidal Pacifist, at the Stand Comedy Club. We were also promoting a ‘best of' show called ‘The Cult of Comedy'. The Cult invites 4 comics to come along and give a 10- minute taster of their Edinburgh Fringe show. They are popular with the comics because it gives them a chance to promote their shows to a potentially new audience. The Punters like them, as it gives them a chance to view a performer they might not know. If they like what they see they might then go and see the full show. It's a win-win, for punters and performers alike. Remember that there are over 2,000 shows on the Fringe and it can be a daunting prospect for visitors, to decide what to watch. The show was in a Yurt outside one of the bigger festival bases (Three Sisters on Cowgate), which is a very short walk from Fringe Central on the Royal Mile. This meant that we had to do very little promoting, as there was a large potential audience outside the pub. It did help that an electronic screen was showing an ad for the show for much of the day and throughout the night! I have talked about my love of fliering at festivals in previous Diaries. This year I was sporting a rather fetching sandwich board. Only in Edinburgh can you stand on a street corner and shout at members of the public (and not be arrested)! I had agreed to play 6 gigs on the Pear Tree Garden stage, prior to the festival, it is run as a Free Festival gig which means that there is no fee but you get to pass a bucket round at the end. It can be a lucrative gig. After meeting with Steven Mackay from Fortune Promotions, who was now running the stage; I ended up with 9 spots. A call from George Fyvie, the general manager (Counting House) a week later, also had me booked into a paid gig at a brand new bar called Ushers. My festival was very much heading towards being busy busy. Sadly most of my out-door sets got rained off, always a risk if you play outside at Edinburgh. At one point George Fyvie was quoted as saying that he always knew when to bring in a raincoat to work, he just needed to check the Garden Schedule and see when I was on! I was invited by Baz Simpson, local bluesman and raconteur, to play at a couple of nights he runs. I caught up with Baz in the Pear Tree Garden, and had a chat over a glass of the black stuff. Baz describes his musical roots as Folk. He has an uncle Jim who was always playing guitar at home. Jim now lives in Liverpool and is a folk singer in his own right. Baz' gran was Irish, and her house was always full of music. For Baz it was ‘folk music first'. Baz' interests are broad and eclectic: blues, rock and roll, jazz and blue grass. His influences (not surprising if you ever get a chance to hear Baz roar the blues) are: Howlin Wolf, Skip James, Screaming Jay Hawkins, Little Richard and “of course” (Baz)- Muddy Waters. In the future, Baz wants to record a couple of albums, a solo acoustic recording of his own earlier material, and a band album. Baz described how the stuff he is doing is changing and he wants to get it down, get it catalogued. ‘Music is a journey'. In the last 5 years there has been a change as his material develops. I asked Baz about the music scene in Scotland. He said there was a lot in Edinburgh and Glasgow. 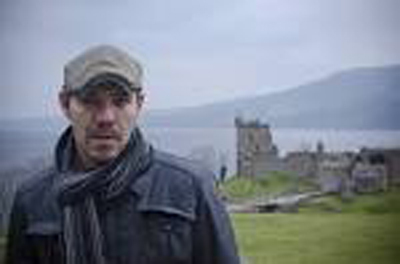 He described the big traditional scene up in the Highlands. Baz talked about his musical roots, influenced by his Irish background. We both share an Irish heritage and Irish musical roots, laughing as we did when remembering listening to and playing ‘Diddly Diddly music'. This was fondly remembered and loved, the Irish music of our grandparents, music that helped to mold our current performance of and love of the blues. If you get a chance to hear Baz take it, he is a true original and an awesome presence on stage. One of the more unusual gigs I was asked to do was a Ukulele showcase at a wonderful old Burlesque theatre, now a Bingo hall, the old Princess Theatre. Built in 1859 as a Variety and Burlesque theatre, it was converted into a cinema in 1912. It was also the most unlikely place to come across a piece of Rock and Roll history- James Burton, Elvis Presley's guitarists' custom Telecaster. Owned and played now by ‘Scotland's veritable Monarch of Rock and Roll'- Jesse Garron. It was on a guitar stand at the front of the stage, where Jesse had been rehearsing. Yes, you did read correctly- a Ukulele showcase! I have never played one before, but always up for a challenge me, I borrowed one, open tuned it, and worked out a bit of slide. The bloody thing went out of tune as soon as I went on stage, The audience voted me second place, which I thought was over generous, I think I may have bamboozled them with the sight of a bearded blues-man, playing slide- ukulele and blowing a blues harp. I wasn't even the weirdest sight that night, but that's Cabaret for you! Tricity Vogue, who had asked me to take part, is a real trooper and stalwart of the Cabaret and Ukulele world. She was wearing a gold dress and was sporting a jaunty hat made of a gold ukulele. The winner of the night got to sit behind her on the stage and play said headdress. Check her out on Utube. I will notch this up to experience; I don't think I will be becoming a regular on that particular circuit! 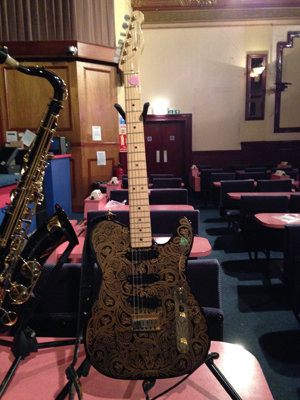 Over the years I have got to know another Edinburgh Bluesman Derek Smith. He invited me to a gig he was promoting and performing with his Main Street Blues Band at the wonderful Jazz Bar in the centre of town. I walked down the steps that lead to the Edinburgh Musical institution that is the Jazz Bar. The room was packed and there was a buzz of anticipation from this sell out show. I had been comped in, so took a spot by the bar at the front; by the time I arrived it was standing room only. Derek Smith took to the stage, to start the session with a short acoustic set. He was joined by fellow guitarist Chris Gray, starting off the night with a chilled vibe which included a sweet slow blues originally by Ray Charles. The tempo changed as the rest of the guys took to the stage, John Hay on bass and George Logan on drums, moving the night up a gear as the home crowd clapped with enthusiasm. This partisan crowd was excited and the expectation was palpable. As I soaked up the authentic atmosphere of this cellar venue at the heart of the city, the electric set kicked off with a solid blues groove. The sound engineer had done a great job, every voice; every instrument on the stage was warm and crystal clear. This was a confident assured performance, where the traditional roles of rhythm and lead guitar were shared, both soloing and filling- it reminded me of watching Lynard Skinnard back in the 70's. No lines of demarcation between the two guitars, just sweet driving blues. A wonderful range of influences, Walter Trout to Robert Cray, all beautifully delivered and backed by a bass player and drummer most front men/women would kill for! The band moved up another gear, slipping effortlessly into a rockier vibe. The Fender/ Gibson rivalry that played out on stage was as faultless, as sound engineer Bill Kyle' (also the bars' owner) spun his musical alchemy, hardly touching the desk- why mess with perfection? The guys morphed into a mean and funky groove, I wonder if there is anything this band couldn't showcase? Black cat bone fills the air, the drum and bass laying down a groove so solid you could drive a ten tonne truck over it. I was left craving and shouting for more with a crowd who were happy, having shared this great show. I wish I had recorded it. But perhaps not, these are the nights we will remember, we share and enjoy, knowing we are having a unique experience – a night of live music. Walking around Edinburgh, like any large urban landscape is the best way to my mind, of seeing the city. The old and the new side by side; like the sound of the bagpipes and the clanking of the shiny new trams on Princes Street. As I walked up to St Andrews Square I could hear a familiar voice- Richard Blues, a great bluesman and regular street performer in Edinburgh during the festival. The Edinburgh Festival is many things, to different people. To new performers, it's a chance to showcase your talent, to others a chance to see and share a truly international event. For me, its hard work, but a lot of fun. It's a chance to catch up and talk to people I know on the circuit who I will only see at the festivals. For me seeing Sameena play at the Stand Press night will be a special memory. As too was watching all the live shows at venues as varied as a Yurt and the Dissection Theatre at the old veterinarian college where I watched a giant white rabbit walk in through a swirl of smoke carrying a body bag! I also started (without knowing it at the time), writing the soundscape for the Poetry Army with my good friend Roy Hutchins. Roy is the narrator and long time collaborator of the marvelous poet, lyricist, scriptwriter, actor, magician and activist- Heathcott Williams. While Roy was up visiting us, we started jamming the words from the Poetry Army (now re-named ‘Stalin's mustache'), with some acoustic blues. This has now, after work and development become a sound track to the work and will form a large part of my performing in 2015-2016, when Sameena and I get back from gigging in Australia. But before migrating south for the winter, I have a gig at the 100 Club in London's Oxford Street, one of my ‘bucket list' venues.